Marvel adds a new superhero to its ever expanding Cinematic Universe with Doctor Strange, a visually arresting actioneer that’s frequently undermined by muddled mythology and a lethal lack of narrative cohesion. These films obviously cater most to the comic book fans who are already familiar with these characters and this world but for newcomers, whom I suspect will comprise the majority of the audience, the “anything goes” nature of this mystic arts setting should inevitably lead to some serious head scratching. Even the more fantastical superheroes like Thor and Hulk are still bound by tangible principles that tie them to the real world but as soon as Strange crosses over into different dimensions, it’s clear that it doesn’t want to play by any discernible set of rules. Benedict Cumberbatch plays the titular neurosurgeon, who is introduced as a haughty concoction of MCU favorite Tony Stark and TV’s Dr. House, though he doesn’t have half of the charisma of Robert Downey Jr. or Hugh Laurie. A near fatal car accident leaves him without the use of his hands, effectively ending his medical career and forcing him to scour the world for a solution. His journey leads him to Nepal and specifically the temple of Kamar-Taj, where Strange meets a wise mystic referred to as the Ancient One (Tilda Swinton) and another master of magic named Mordo (Chiwetel Ejiofor). Being a steadfast man of science over faith, Strange is initially resistant to their spiritual methods of healing but is quickly made a believer when the Ancient One opens his eyes to phenomenons like inter-dimensional travel and astral projection. He dedicates himself to the practice of mystic arts and progresses quickly, which allows him to square off against the fallen sorcerer Kaecilius (Mads Mikkelsen) as he plots to unleash a powerful evil from the Dark Dimension onto Earth. Strange’s love interest Christine Palmer (Rachel McAdams) also turns up from time to time as a fellow surgeon who is asked to perform spontaneous operations on key protagonists. You probably get the sense that this film is all over the map not only in the literal sense but also in terms of narrative and tonal ambition. Perhaps Strange warrants a more lengthy investigation through a miniseries like Jessica Jones and Luke Cage recently received on Netflix because two hours just doesn’t seem like nearly enough to cover this ground. I don’t envy the task of director Scott Derrickson to introduce us to a brand new superhero while also explaining the boundaries of a conceptually complex new setting but he does a poor job at doing either with any sense of personal flavor. It doesn’t help that the attempts at humor almost unanimously fall flat (unless seemingly stoic characters jamming out to Beyoncé is up your alley) and more laughs instead stem from the unintentional side of things. There’s something overwhelmingly silly about the way Strange and a rival spirit duke it out in the astral plane while hospital objects in the real world move the slightest inch to suggest their otherworldly involvement. 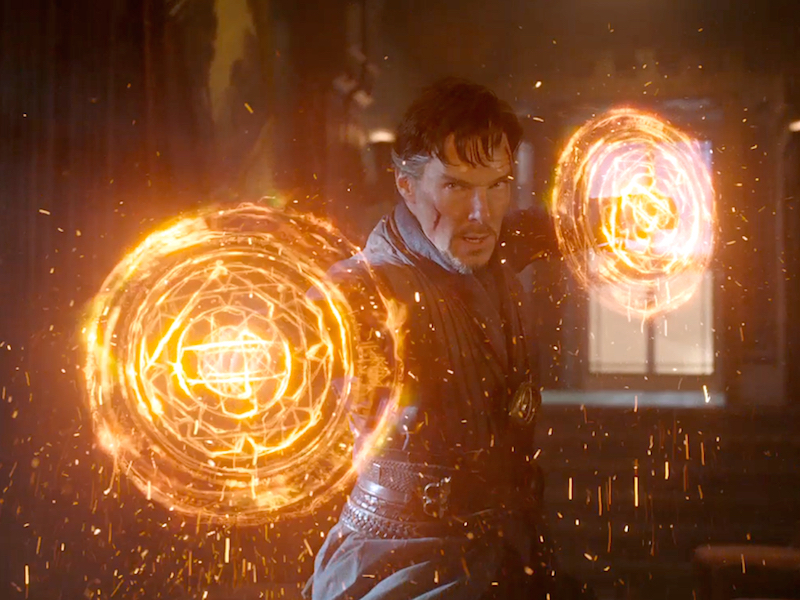 Doctor Strange is a bewildering mess of a Marvel movie, not without some admirable visual trickery but also not a worthwhile addition to the already packed stable of heavy hitters in the MCU.